UNI MEI is the division of UNI representing workers in the media, entertainment, arts and sports sectors (staff freelance, independent and contract workers). It brings together over 100 union and guilds in over 70 countries. UNI MEI caters to the special concerns of unions and similar associations whose members are engaged in mass media, entertainment and the arts. UNI-MEI serves as a point of contact for its affiliates and the members they represent in this increasingly internationalised sector. It is a clearing house for information useful to them, particularly that regarding bi-national or multinational productions, or movement of employees across national borders. It is concerned with issues ranging from ownership structural evolution, trade policy and technological change to copyright and neighbouring rights, piracy and censorship. It acts to exchange information about collective agreements, legal standards and practices of the categories it represents at an international level, aiming where relevant and feasible to temper chaotic labour relations and practices with common regional or wider minimums in consultations with employers or in practice alone by employee concertation. 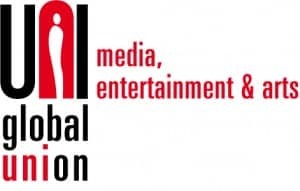 UNI MEI sees part of its role as encouraging stronger links between those active in the media, entertainment and the arts and the trade union movement in general. Other activities include coordinating solidarity with affiliates and others in the sector, both in industrialised countries and in developing ones, in cases of labour disputes, infringement of trade union or human rights or of freedom of expression in the arts or media. It seeks to stimulate audio-visual production and the arts. It also has observer status with several inter-governmental bodies. It seeks to identify and defend the interests of its members in these bodies and in other international public policy arenas.